Unas vacaciones de ensueño en el noroeste a solo una hora de Seattle, ubicado en Stretch Island, a minutos de Fair Harbor. Casa de cedro contemporáneo con .5 acres de playa a solo una hora y 20 minutos de Seattle. No se requieren transbordadores, a menos que desee tomar un bote y conducir desde Bremerton, Southworth o Kingston. Sumérjase en la vista de 180 grados de la playa y el monte. Rainer desde la sala de estar con ventanas de proa de 20 'de altura. La casa tiene una gran suite principal en el piso superior con buhardilla y nido de cuervos. En la planta baja alberga una gran habitación y baño. La casa puede alojar cómodamente a 6 personas. Explore acres de tideland privado prístino, durante la marea baja puede caminar por el borde de toda la isla. La playa ofrece muchos avistamientos de vida silvestre: focas, nutrias, una multitud de patos marinos, águilas y garzas, si tiene suerte Orcas. La isla es hogar de ciervos, zorros, faisanes, búhos. Explore las aguas de la bahía norte con kayak y alquiler de SUP en la cercana localidad de Allyn. Para los fanáticos del golf, Chamber's Bay en Tacoma recientemente fue sede de los EE. UU. Abierto es de 40 minutos. Para aquellos que buscan jugar cerca, el muy alabado Gold Mountain Golf Club en Bremerton está a solo 15 millas de distancia. Los huéspedes tienen acceso a una barbacoa de gas propano, fogón, leña y mesa de comedor al aire libre. La playa inmediata es parte de la propiedad de alquiler. Las playas del norte y del sur son propiedad privada, pero puede explorar y caminar por la playa en cualquier dirección. Ideal para familias o una escapada romántica. La playa es segura y accesible a través de las escaleras de la comunidad. La isla es un retiro ideal de la ciudad para parejas y familias. La ciudad de Allyn está cerca y tiene una gran heladería, Big Bubbas Burgers, nuestro restaurante mexicano favorito, alquiler de kayak y SUP, y no te pierdas la galería al aire libre de motosierra. El verano también ofrece el raro Drive-in Theater a solo 20 minutos de distancia. 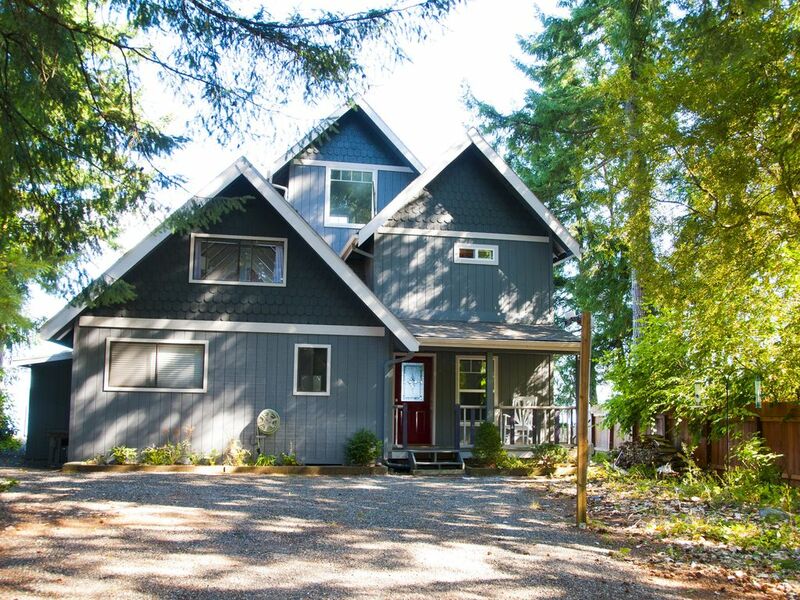 We rented this home for our visiting family for Illinois to give them the full pacific northwest experience and that is exactly what this home provided. They felt very comfortable and at ease while relaxing and taking in the wonderful views. Heather was very easy to communicate with and very accommodating. Setting can't be beat. Lovely home. We took a family vacation to Washington, which ended with our stay here on Stretch Island for a week. The house is lovely, with new flooring, new furniture and good Wifi. The living room has vaulted ceilings that really open up to the expansive views. Homeowner Heather helped us in our efforts to travel with a one year old by tracking down a pack-n-play, and a high chair, and by offering advice on places to see the Fourth of July fireworks. She really went above and beyond. There are many destinations within an hour or two of Stretch Island, including drive-in theaters showing double-features (! ), all that Seattle has to offer, Tacoma and its amazing Glass Museum, Olympia National Park, the State Capital and more. A memorable vacation at a memorable location. I was in the area for a wedding and decided to rent a house instead of a hotel room. It was perfect!! Great location and very peaceful. The neighborhood is quiet and close to Allyn. House has 2 bedrooms, but several couches and rollaway’s if needed. Very clean and comfortable. We highly recommend a stay at this lovely home above the seashore! Room by room, it is spacious and cozy and ever so comfortable. We left well-rested and renewed in body and soul. You'll be so happy you found this gem on Stretch Island! Nice updated and modern house right on the water. Great views and great host! This house was pretty amazing with the updated/modern interior, amount of privacy from neighbors, and the awesome views from the nice deck in the backyard space. The host was very quick to respond to all of my questions and emails. I would rent here again. La propiedad se encuentra enclavado en North Case Inlet Sólo una hora de Seattle, media hora de Tacoma y Bremerton. Gran punto de lanzamiento para explorar el South Sound, la Península Olímpica y el Canal de la Capilla.